Over the past few years, I have watched with great interest friends and fellow artists who have created visual diaries from taking photographs of their everyday life and themselves. Many of these projects have been shared on Facebook and other social media channels, making the experience as a viewer immediate and intimate. I also love the Day in the life of series of books as they create a create sense of time and place. One of my favorite projects is the Rock a Day for my Creativity project by friend and artist Jo Tito. Her project demonstrates a commitment to being more creative and to having focus and discipline as an artist and writer. What is really wonderful, is that now three years later, Jo has amassed a great collection of images, stories and rocks, that she continues to use and build upon in her art practice. Another source of inspiration is Maria Popova’s statement that “every city needs a love letter” in her Brain Pickings article, A Love Letter to the City about artist Steve Powers. 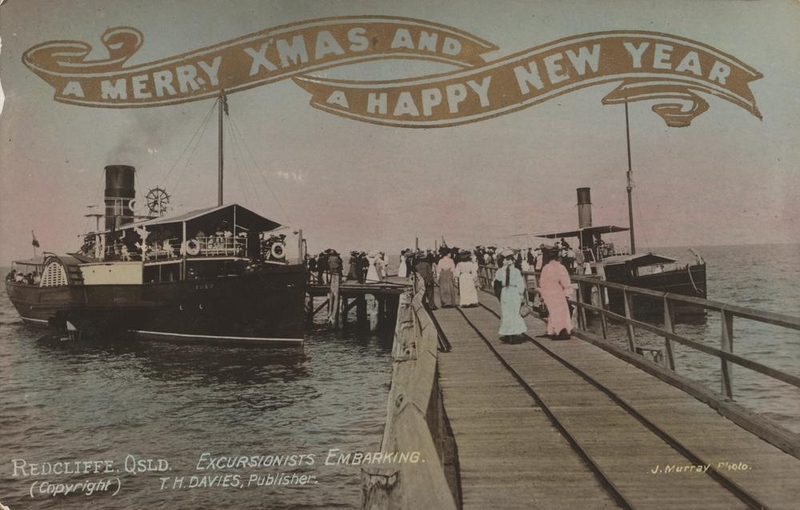 Christmas greeting card featuring Sutton’s Beach, Redcliffe, Photographer: Murray, J. 365 Places is a dedication to geographical connections to place through storytelling. It is an exploration of where I have been and where I would love to go. 365 Places is probably the most literal project I ever created that relates to place, as in the past, there has been an overriding theme that connects the project to other ideas – e.g. Big Banana Time Inc. and Fauxonomy. This project, like Jo’s is intended to make me accountable as a writer and artist who works with ideas of identity and ‘place’. Also, like Jo I need to set guidelines for time – 1.5 hours maximum per day. However, I can’t wait for the 1st January 2015 – this project will start on the 20th April 2014, coincidentally my parent’s wedding anniversary. My first post is a tribute to them, the place where they made their first home together and my first home – Redcliffe. Every day for one year, I will bring you a story about a place, sharing with you why I think it is special and unique. If you have any special places you would like me to write about please contact me and I will write you a story. The images will either be our own, contributed by readers or from Flickr Commons and authors will be attributed. At the end of the project, we plan to publish a book about this journey. Check out the page 365 Places for a complete list. Love your blog! Do you want to follow me back on http://www.gossipgirlnetherlands.wordpress.com. I will give you a shoutout! Thank you! I would love you to give me a shout out – already following your blog – it looks great – hope to see more from your holiday to Turkey – it is one of my favourite places! 365 Places is a new project by Tracey Benson exploring the places she loves and the sites of desire.